The melodies of these ragas were what filled up the empty spaces left in the young boy's life by his physical disability. The ragas provided him with courage to overcome the darkness that enveloped his life due to his blindness. Once captivated by the effects of the violin, Afzalur Rahman made his way to Comilla to learn more about the instrument from the great Ustad Ayet Ali Khan. It is not every day that we see an individual with a serious impairment like blindness overcome the suffering of a tragedy such with grace and stoical acceptance. It is not often that we witness a person conquer the darkness and sorrow instilled into his life by the loss of vision with a passionate zest for life and love for music. One such individual is today's leading sarod player of the country, Ustad Afzalur Rahman who is perhaps the only visually impaired sarod player in the world. He is from Brahmanbaria- the district that is the home of the famous musical brothers Fakir Aftabuddin, Ustad Alauddin and Ustad Ayet Ali khan. 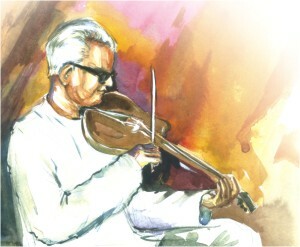 Having lost his eye sight due to typhoid at the age of nine, Afzalur Rahman was encouraged to learn to play the violin. Apart from the violin, he was also interested in the traditional folk instrument, the dotara. As a child Afzalur Rahman was trained to play violin by Babu Hemanta Kumar and was introduced into the mesmerizing world of ragas by Ustad Israel Khan. The famous musician, who was the brother of the legendary maestro Alauddin Khan, took him in as part of his own family and trained him. The next year, that is in 1953, Afzalur Rahman performed at a musical conference at the court of the Maharaja of Tripura, Agartala where the illustrious Ustad Alauddin Khan was also present. Impressed by Afzal's performance, the Ustad gave Afzal his blessings saying that one did not need eyes to see if one could connect with the audience through his or her music. On the same occasion, Ustad Alauddin Khan performed on the sarod himself and, dazzled by the maestro's performance, Afzal decided to give up the violin and learn the art of the sarod instead. This offended the Ustad but since Afzal was so dear to his heart and because he persistently begged for forgiveness, eventually he was forgiven. After Afzalur Rahman took up the sarod, recognition soon came his way. In 1954 he won a first prize at the National Competition which was held in his home district, Brahmanbaria. After he won that competition, National Radio started broadcasting his performances and from 1962 onwards, his works on both the sarod and the violin have been broadcast regularly till date. In 1967 he performed on the National Television of the country. Since then Ustad Afzalur Rahman has been regularly performing on our national television. One event led to another and he was soon invited to the Alauddin Sangeetangon to be the head of the instrumental department. There he learned and mastered the Sitar, Flute, Tabla, Esraj and the Guitar. The 1977 Comilla Foundation gold medal, the 1978 Education Minister's gold medal and the 1998 Rabindra Padak are a few of his achievements in the musical field. Setting up the Ustad Ayet Ali Khan Srmiti Mancha in his home town may be considered another one of his great achievements. It is a musical institution that has been carrying forward the tradition of the well-known and prestigious Khan gharana. Setting it up only goes to show that even after so many years, despite the cruel realities of life that he has been faced with, Afzalur Rahman has remained steadfast in his love for and devotion to music. He also played an important role in building the National Philharmonic Orchestra at its initial stage. Ustad Afzalur Rahman is the founder of the Inner Eyes Family Orchestra. This, as is evident from the name, comprises of his family members - his wife, two daughters, his sister-in-law and her husband. His wife and the only visually able member of the family is Anwara Rahman. She is an apt guitar player and is one of the very few female sarod players of the country. It is her constant dedication and support that has made it possible for the family to stand tall and proud today. Afzalur Rahman has two daughters. The older of the two is Mohua Rahman Ruba who started losing her eyesight at an early age due to a glaucoma attack. Mohua has specialized in singing popular Bengali songs as well as in sub-continental classics. She sings fluently in Hindi, Japanese and English, and has participated in several concerts both at home and abroad. She, like her parents, plays the sarod alongside the violin and the tabla. Mohua has won 12 national awards and 6 gold medals till date. The youngest member of the family is Antara Rahman TungTang. She is completely visually impaired. Antara is an expert violin player and loves to sing the songs of Rabindranath Tagore. She has been performing in National Broadcasting media since 1997 and is an enlisted artist of Bangladesh Betar. Afzalur Rahman's sister-in-law Angura Rahman has also been trained in music since childhood. Ustad Afzalur Rahman himself has trained Angura from a young age. She plays the sitar, and often accompanies her brother-in-law and guru on big occasions by playing the tanpura. 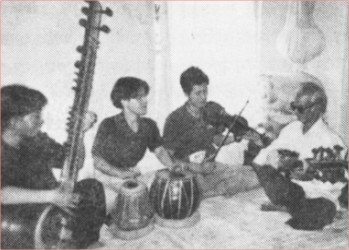 Ustad Afzalur Rahman's immediate family was the founding core of the Inner Eyes Family Orchestra but more and more people joined it as time went by. 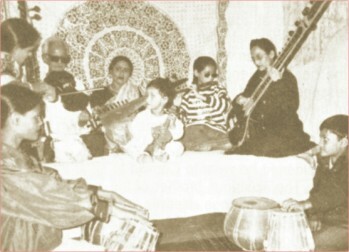 A.K.M Mohsin is an important name related to the family orchestra. He is one of Afzalur Rahman's disciples who played a very significant role in forming not only the Inner Eyes Family Orchestra but also Ustad Ayet Ali Khan Smriti Mancha and the National Philharmonic Orchestra. Mohsin has always been a faithful disciple and has stood by Afzalur Rahman throughout the passing years. He too plays the sarod but is more involved in promoting the orchestra internationally. Except for his wife, all the other members of Ustad Afzalur Rahman's family suffer from visual impairment and yet they never gave up hope. They remained dedicated to their passion - their music, and moved on to become versatile musicians. We learn from their life story that no matter how dire the situation is or how cruel reality poses to be, one must always strive to move on and live life to the fullest and be somebody in life. The many achievements of Ustad Afzalur Rahman and his family are truly praiseworthy and we should consider ourselves fortunate to have such talented artists in our midst. Not only is he and his family a source of pride for our nation, they are a source of inspiration for us, both young and old,and especially those who suffer from disabilities. The inner eye is what matters.